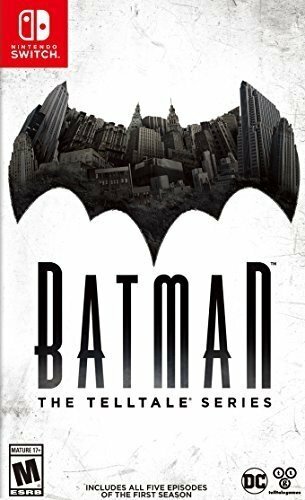 Before we begin, I think I should start this review by admitting that I had never played a Telltale game before I played this one. I had heard many wonderful things about the company’s treatment of 'The Walking Dead' and 'Game of Thrones' games, but I had never actually taken the time to get into either of those series. It’s an odd thing because I’m a pretty big fan of both of those franchises, but ultimately I suppose I had too many other things on my plate to devote time to yet another gaming venture. Yet, when I saw that the company had ported their popular Batman title over to the Nintendo Switch, I was intrigued, and therefore quite excited when I received a copy as a gift. Batman: The Telltale Series originally appeared back in 2016 on the PlayStation 4, XBOX One, and PC as an episodic release. Essentially, this meant that those wanting to play the game at release had to buy it one episode at a time, with the final episode releasing in December, 2016. The Nintendo Switch version, though, is a complete collection of all of the game’s episodes, wrapped up into a nice, concise package. Also, since the game is on a physical cartridge, that means players won’t have to go and download subsequent episodes. 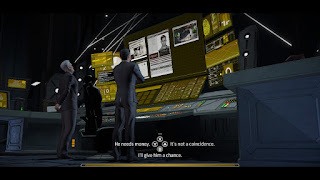 For those who have never played a Telltale game before (like me, until recently), these games are very story-heavy, cinematic experiences that are driven by 'Quicktime Events', which rely heavily on the choices made by the player throughout the experience. Essentially, if you are expecting something akin to 'Batman: Arkham Knight' you’re going to be sorely disappointed, but if you’re someone who craves a powerful and immersive story, I think you will be very pleased with this one. The game’s story is a modern take on the Batman universe, giving its own spin to some of the series’s established lore. Bruce Wayne’s parents, for instance, weren’t killed after taking young Bruce to a play, but rather after taking him to a showing of the 1998 version of 'The Mask of Zorro'. This is something that Bruce, as an adult, refers to in reference to his adoption of the Batman persona. 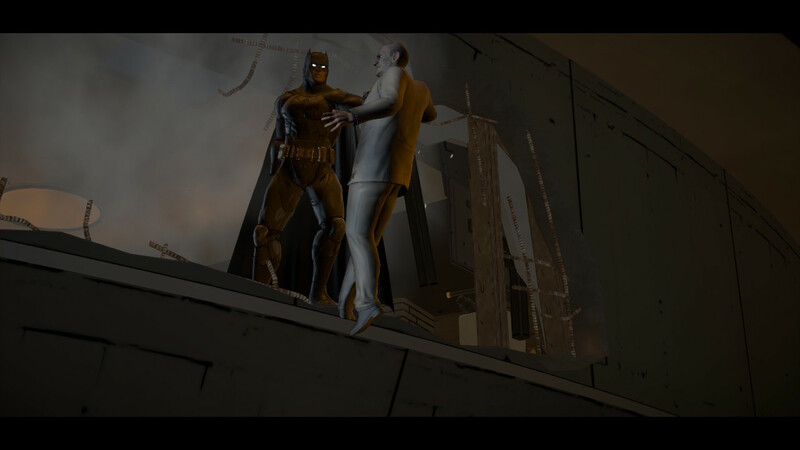 Yet, I appreciate the fact that the game doesn’t start us off with yet another retelling of the Batman origin story, but instead, picks up in the present day with a tale of action and political intrigue. While we don’t necessarily get a clear timeline of all the events leading up to the present moment, it seems like when the game starts up Bruce has only just recently begun donning the guise of Batman in an effort to make the streets of Gotham safe again (circa Year One). Overall Bruce is leading a very busy life, trying to balance his “nightly activities” as the caped crusader with his role in Wayne Enterprises, which includes his involvement in the political campaign of his friend, Harvey Dent (soon to be Two-Face), who is running for mayor against the corrupt incumbent, Hamilton Hill. Everything kicks off with a bang when you start a new game, sending Batman off to fight a group of heavily-armed mercenaries when they break into Gotham City Hall. It’s within this sequence that we familiarize ourselves with the fast-paced 'Quicktime Events' (which I mentioned before), where our precision button-pressing skills determines how well Batman will do in combat or if he will survive certain actions (such as grabbing a ledge in time when falling from a great height). We’re also introduced to Catwoman in the beginning too, when she steals whatever it was the mercenaries were after at city hall, and a brutal fight breaks out between her and Batman. However, all of this fast-paced action is soon given a stark contrast when the story shifts back to Wayne Manor, presumably just an hour or so later, and Bruce Wayne is hosting a campaign event for Harvey Dent and has to wine-and-dine folks just the right way. An uninvited guest in the form of mob-boss, Carmine Falcone, gives the player their first meaningful choice on what to do: Will they be seen shaking hands with an entertaining a known criminal or will they take the personal risk of shunning such a powerful man? Their choice in that moment determines how Bruce Wayne will be seen in the public eye in the immediate aftermath. 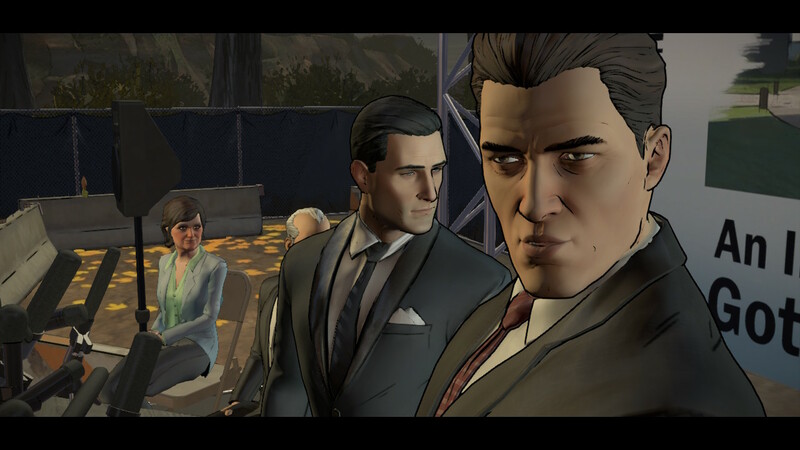 I’m not one to spoil a good plot, but I will say that I liked what Telltale did with the franchise overall. 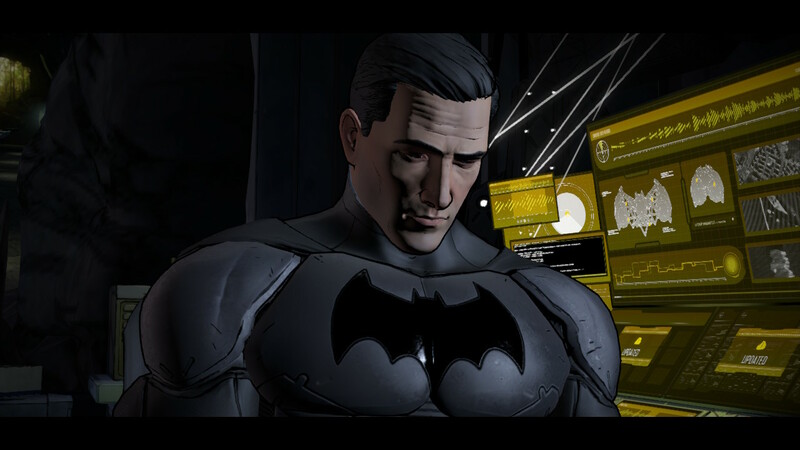 Yes, as the plot develops we are eventually faced again with Bruce Wayne’s origins on his journey to becoming Batman, but Telltale puts a completely new spin on things. In the past, Thomas and Martha Wayne were seen as a pure, guiding light in Gotham City bent on doing right by its citizens. Bruce’s father was a physician and his mother was a philanthropist and they used their vast fortune to try and better the city they called home. Yet, while some of that is still true in this new take on things, things are certainly not nearly as clear-cut here. 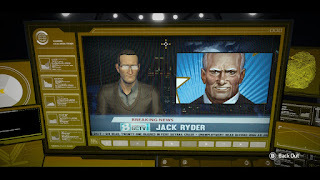 Bruce soon finds out that accusations cast against him in an effort to distance his deep pockets from Harvey Dent’s political campaign may have some merit and that perhaps his parents weren’t who he grew up believing they were. When it comes to the overall presentation on the Nintendo Switch, as a whole everything holds up quite well. The game looks very nice when played on the Switch’s native 720p tablet display, making it great for on-the-go gaming or just lounging around the house, and still looks quite good when played on a TV. While some graphical assets have been cleaned up for this release, it’s apparent that the PC release is superior in terms of overall visuals, but the difference isn’t enough to matter in my opinion. The flexibility to play on your TV or in tablet mode more than makes up for any visual trade-offs made in the process. The sound quality, meanwhile, is as solid as ever. The voice-acting in the game is top-notch and the voices come through sharp and clear. The soundtrack is equally good as are the overall sound-effects used throughout the game. The end result is very cinematic, and if it weren’t for the decision-making and the action sequences you have to play through, you could easily forget you were playing a game as opposed to watching an animated film. The controls, meanwhile, are a bit of a mixed bag. While I certainly appreciate the versatility the game offers by being able to be played in tablet mode, with the joy-con controllers, or with the Switch Pro Controller, I feel that regardless of your chosen method things can sometimes feel a bit stiff and “off.” There were plenty of times while playing the game where I felt unsure whether some of my button-presses were actually registering or not. There were also times when I was quite sure I had pressed the correct button and yet the game didn’t seem to catch my input. Thankfully, this didn’t result in me dying and having to restart a scene, but it still was annoying when this happened and I could see it causing frustration for other players as well. This is especially true during those sequences where you have to line up a cursor using the right control stick and then press a certain button within a set time limit. Sometimes you also don’t realize what you need to in order to get it done in time because the game isn’t always clear about that. Still, one of the best things about the game are the choices you’ll make during your playthrough. While some choices won’t have an impact that is immediately felt, others will most definitely directly affect how certain things play out and Bruce’s relationships with certain characters. This includes minor things, like whether he will allow investigative reporter Vicky Vale to stay at his campaign event, to whether he will turn over damning evidence about Carmine Falcone to Vicky Vale or Lieutenant James Gordon. As Batman, he will also have to make decisions that will directly determine how he is seen by the public: Either as a monster to be feared or as a hero to be respected. The desire to see how different choices will affect the game certainly adds to its replay value. Also, at the end of each of the episodes, you will get to see a readout of all the choices you made compared to the choices made by other players. A follow-up “season” entitled 'Batman: The Enemy Within' was released episodically between August 2017 and March 2018, so I hope that a complete collection of that game is eventually released at some point. Meanwhile, if you haven’t already purchased and played through all the episodes in this first title, picking up this complete edition on the Nintendo Switch would be a good move. It’s an excellent, fresh take on a well-established franchise and a perfect balance between the worlds of video gaming and cinema. Is it perfect? No. But it’s incredibly fun nonetheless.